The DMM Alpha Sport quickdraws are purpose-built for the most intense sport climbing where every millisecond wasted on fumbling with 'biners or missing clips feels like an eternity - that's exactly what these quickdraws put an end to. Every feature of the DMM Alpha Sport quickdraws has been catered specifically for the demands of modern sport climbing; easy handling and simple clipping are obvious - and DMM have paid special attention to these needs - but technical features that keep you completely safe, ensure the longevity of your equipment, whilst remaining strong and reliable make the Alpha stand out from the lower ranks. There are three parts to the Alpha (see the features below for an in-depth description of its constituent parts): on the bolt end is the Alpha Pro carabiner, ergonomically designed for maximum handling efficiency with a snag-free keylock for first-time clipping; on the rope end is the Alpha Clip, the same in ergonomic handling prowess as the Pro, but with a bent-gate clip designed for effortless clipping and a geometric design adapted for complete rope safety; and finally, the variable width sling keeps the 'biner locked in position to always ensure correct loading and thus zero inconvenient fumbling. DMM have thought of every little detail in the Alpha Pro, and, with the addition of a few small but innovative features, have produced the alpha: superior in every way, outperforms every time, and dominates on route, it takes the seat as king-draw. When DMM designed the Alpha Clip, they were determined to produce the most ‘clip-friendly’ carabiner ever made. Each part of the Alpha Clip has been designed to work with the demands of sport climbing. For ease of clipping, the bent gate has been designed with a flared-out barrel for smooth and effortless clips - which also prevents accidental unclipping - and its geometric shape with a wider and grooved back allows for a more natural hold and greater grip upon the carabiner. When the rope is clipped, its geometry is designed to keep the rope in its place: a deep and wide basket with rope grooves ensures the rope sits correctly as well as working to spread the rope's forces, making it kinder to ropes and safer to use. 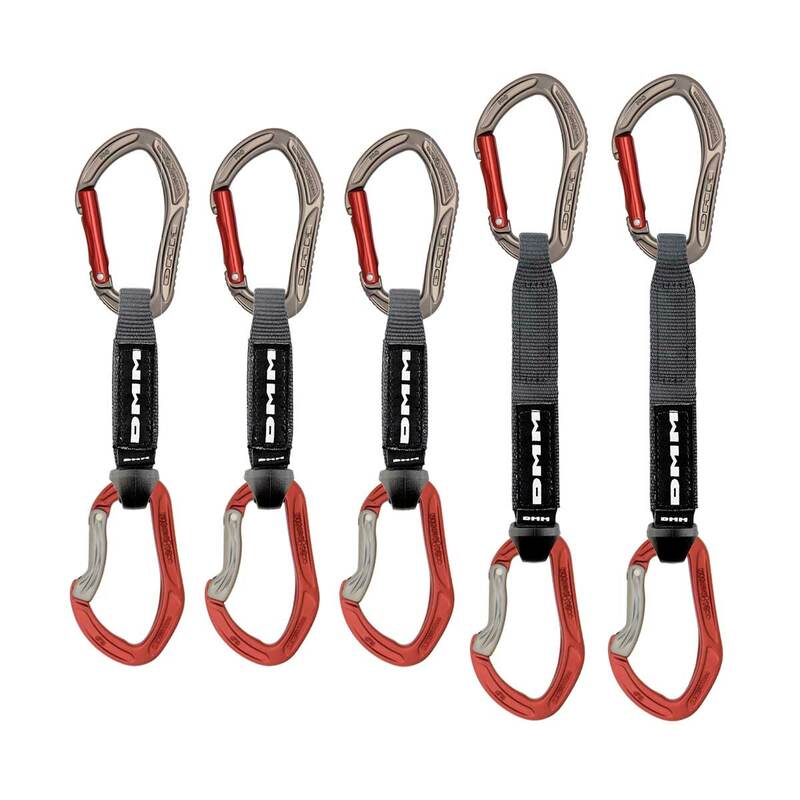 Easier to clip and hold onto, with features that increase longevity of your 'biners and ropes, the Alpha Clip enables you to get the rope in first time, every time, when every second on a hard climb counts. Bolt hangers can be very unforgiving with lightweight ‘biners, particularly if you are dogging about and taking repeated redpoint falls. The Alpha Pro is robust and strong enough to cope with typical sport climbing scenarios and features a snag-free keylock nose for quick, efficient clipping - but what really makes it stand out from the crowd is its exceptional handling qualities. Its distinctive shape is no accident: the kinked backbone and grippy groove pattern on the apex of the spine are there to work ergonomically with your hands, making sure you never fiddle or slip when, clipping is the difference between sending or whipping. A robust and sling made to suit the kind of abuse sport climbing and redpoints bring with it. The 26mm variable width nylon is designed to be strong and easy to grab, but practically tapers down to a neat 16mm, ensuring it sits securely in the crook of the 'biner and always loads correctly. At the rope end 'biner there is an injection-moulded keeper which keeps the 'biner locked down and correctly aligned, ensuring easy clipping and optimum loading whilst also protecting the webbing from abrasion, enhancing the longevity of your quickdraws. I-Beam construction means that any unnecessary weight has been removed in the areas where it won't affect its strength performance, resulting in a significantly lighter yet just-as-strong 'biner.